Please bear in mind that this article was written many years ago – June of 1993. 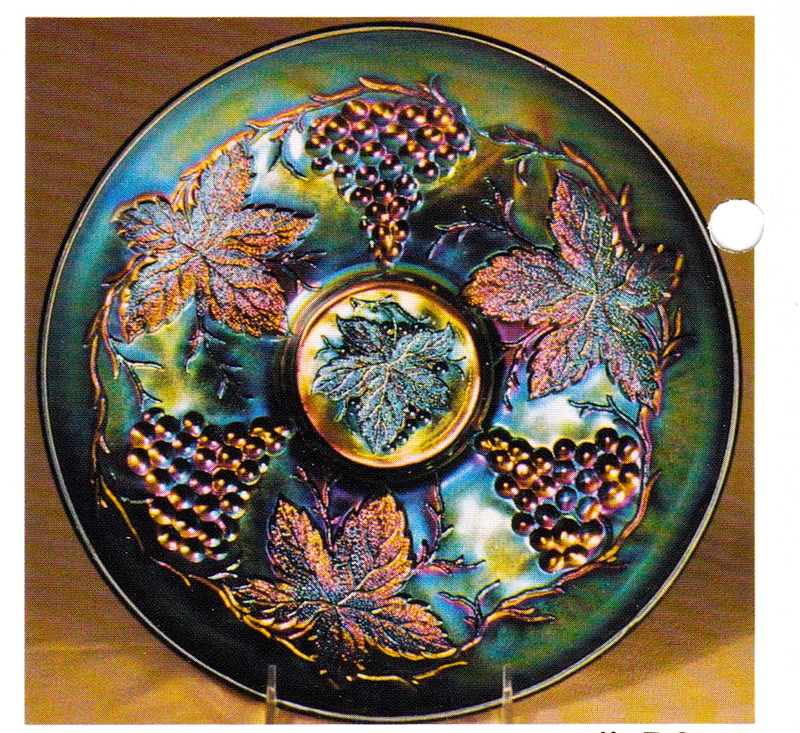 In 1974 I wrote an extensive article on grape patterns for the American Collector that has been defunct now for many years. 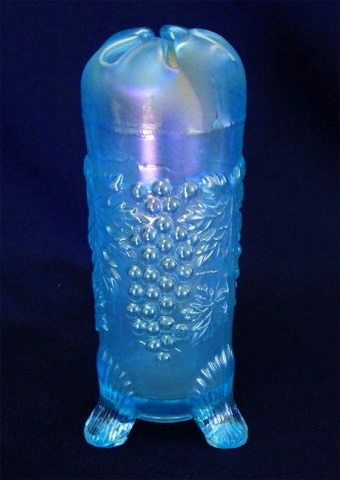 It was entitled “Grapes of Glass” which I thought at the time was terribly clever. In retrospect, I now realize this may have played a part in this publication going under. So I want you to know that it has not been easy to come up with this equally corny “Grape Delights” title for this article on the same subject. I only hope that the Pump is strong enough to weather this character defect of mine that I can’t seem to control. One saving grace is the suspicion I have had that most of you only look at the colored pictures anyway. 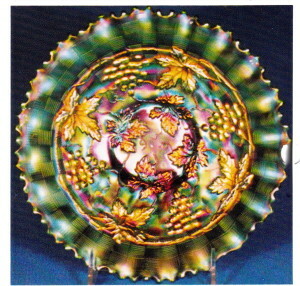 There can be little doubt that the grape was the leading subject of Carnival patterns. It was followed closely by peacocks, with roses, holly and berries, of various kinds, in hot pursuit. Northwood’s Grape and Cable must be given “king of the hill” status with Imperial Grape and the various Vintage patterns in challenging positions. 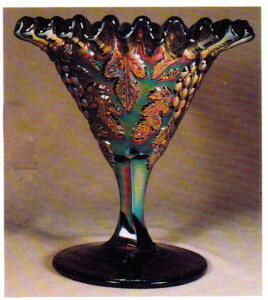 VINTAGE – In addition to many other shapes, this Fenton pattern is found in both 9” and 10” bowls. The large bowl shown here in celeste blue is the first one to turn up in this color. I consider it one of the more outstanding pieces in our collection. 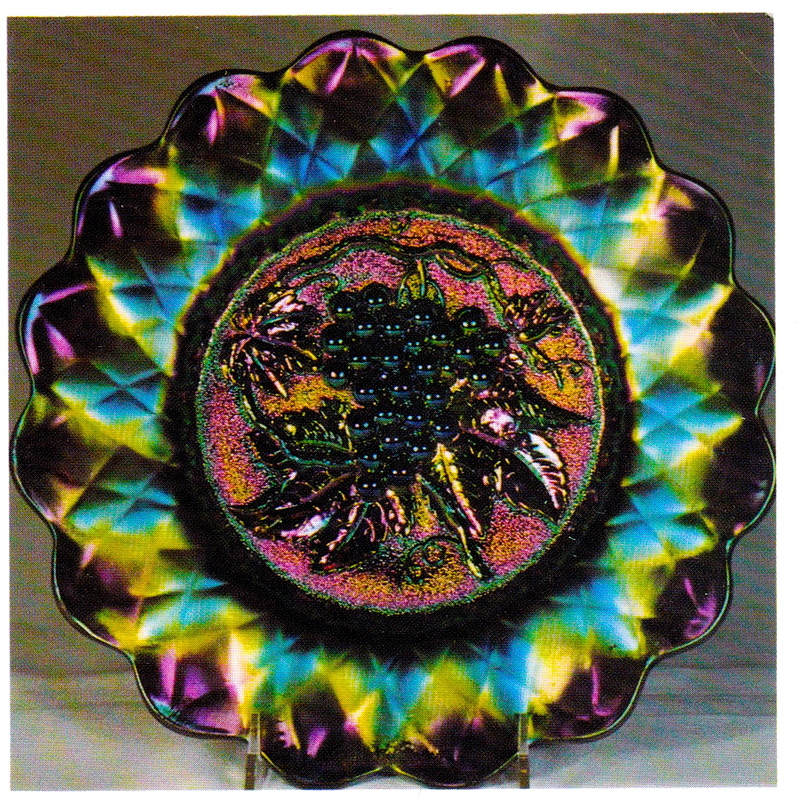 IMPERIAL HEAVY GRAPE – These 11” chop plates are particularly beautiful in purple. 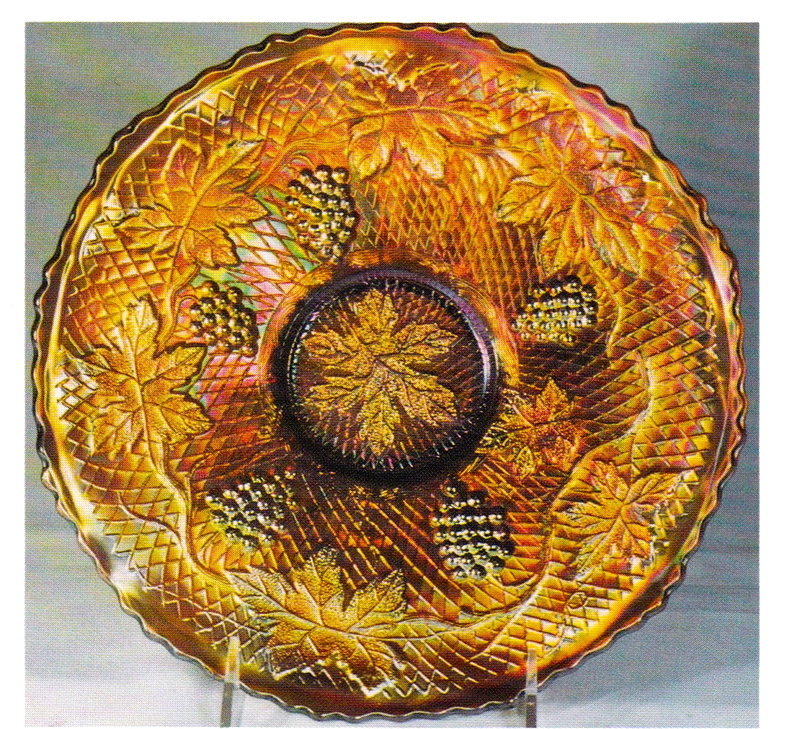 This pattern comes in equally attractive 6” and 8” plates as well as berry sets, punch sets, and nappies. In addition to purple, the colors are marigold, green, amber, and smoke. 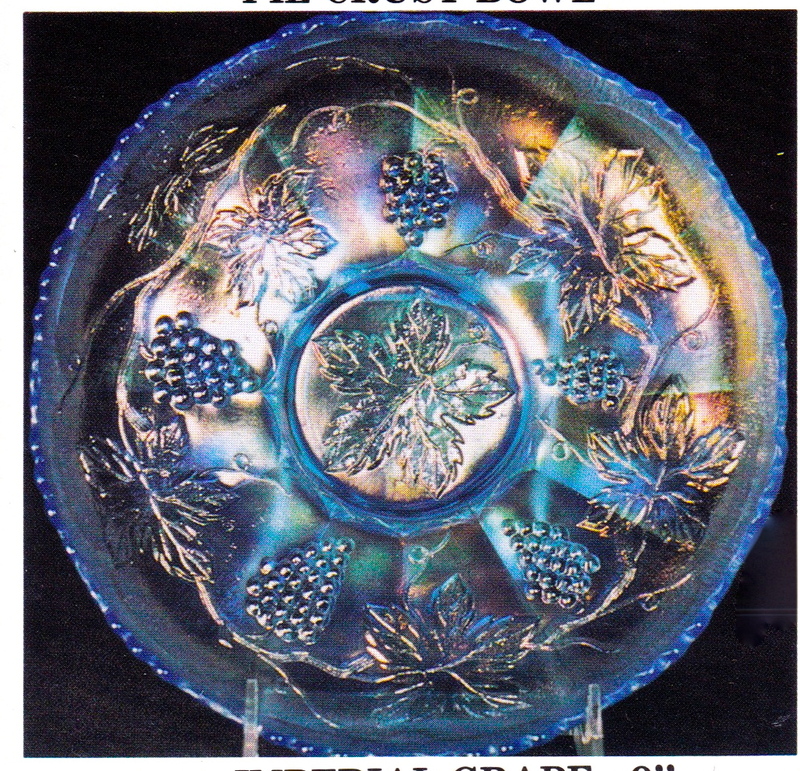 DEEP GRAPE – This compote is a Millersburg contribution to the array of grape patterns. 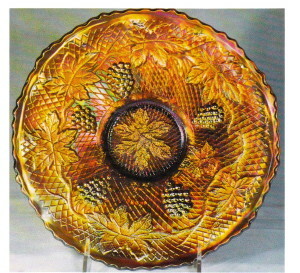 The piece shown is unique as it is the only one with a crimped top. The standard shape is either round or square but not crimped. It is found in marigold, green, amethyst, and rarely in blue. 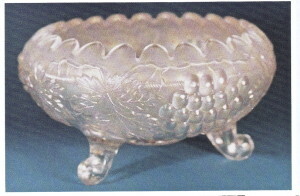 One compote is known in a rare rose bowl whimsey shape. GRAPE AND CABLE – This most famous of Northwood patterns was made in nearly fifty different shapes. 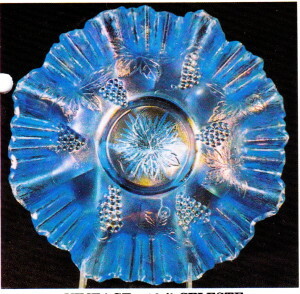 The popular sweetmeat shape shown here is quite available in purple, but rare in marigold, and extremely rare in blue. VINTAGE/HOBNAIL – These Millersburg Vintage pieces carry the Hobnail as the reverse pattern. 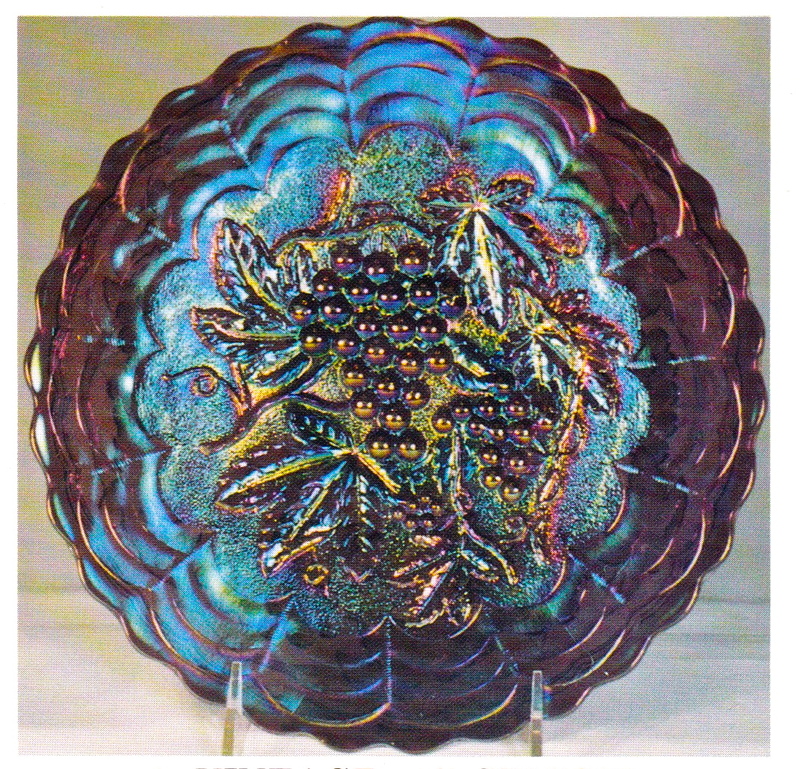 The 9 1/2” bowl in this pattern is scarce, but the sauces in any color are downright rare. 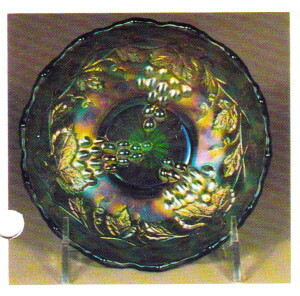 GRAPE AND CABLE – This popular centerpiece bowl comes with the points turned in as shown, or with the points going straight up. The colors most frequently seen are purple, marigold, ice blue, and white. 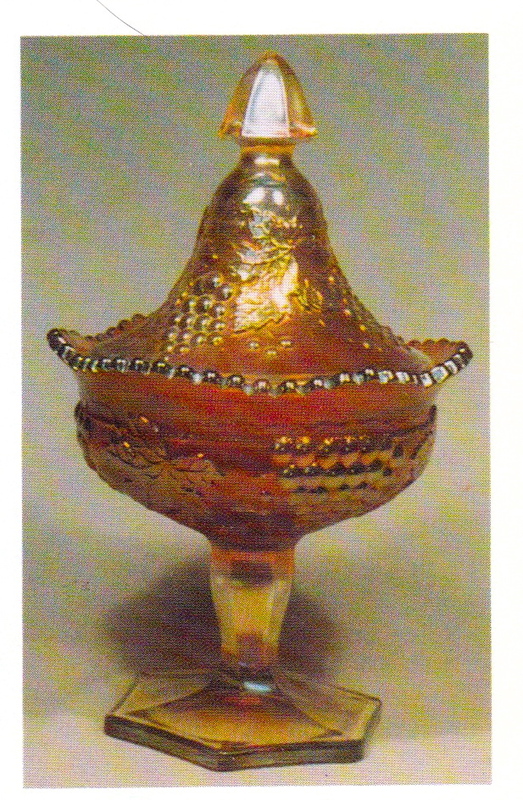 GRAPE AND CABLE – The hatpin holder is always in demand. It seems to typify our Victorian period. These are rare in white, ice blue, ice green, or blue, but are still readily found in purple, marigold, and green. CONCORD – This Fenton pattern was made only in a plate and bowl. They are found in marigold, amethyst, green, and blue. The design is simply the standard Fenton Vintage with the lattice effect as an added feature. DUGAN HEAVY GRAPE – This large 10 1/2” bowl is usually ruffled. The ice cream bowl shape shown here is unique. A very few 5 1/2” ruffled bowls have turned up. Compass is the reverse pattern on these pieces. 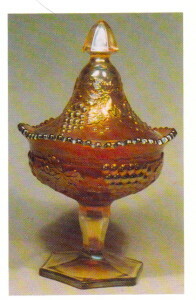 The color normally seen is purple but the master bowl has turned up now and then in peach opal. VINTAGE – This is the standard 9” size of this Fenton pattern as opposed to the larger 10” bowl shown in celeste blue in Photo #1. The larger bowl carries an extra bunch of grapes. Both sizes are rare in red. The ribbon candy edge shown here is unusual for this piece. 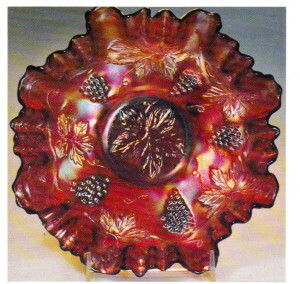 GRAPE AND CABLE – These 9” pie crust edge bowls are usually beautiful and popular in any color. When found in aqua opal, ice blue, or ice green they are also rare and bring big bucks. VINTAGE – Here again is the smaller version of this pattern in celeste blue. 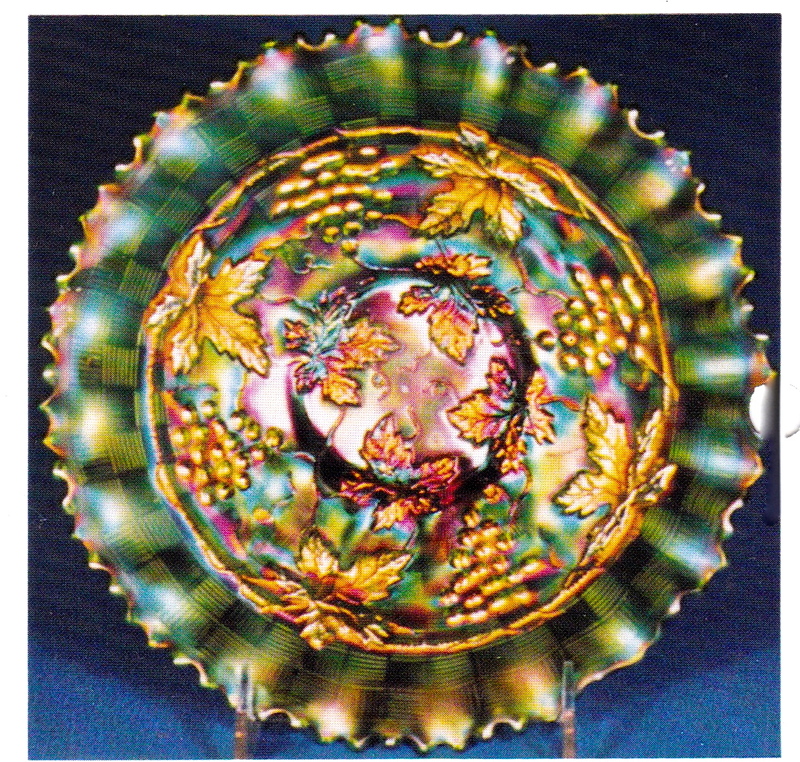 There is a second one known in this color, but is ruffled, I understand, as opposed to the ice cream bowl shape shown here. 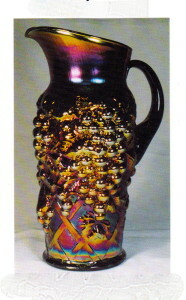 IMPERIAL GRAPE – Only the Grape and Cable pattern is more prevalent and better known that this grape pattern. 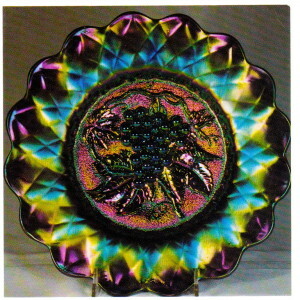 The purple 9” plate shown here is only one of the many shapes made in this famous pattern, including water sets, punch sets, wine sets, berry sets, carafes, compotes, etc. Even a couple of rare spittoons are known.